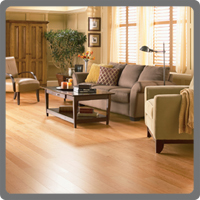 If you want an alternative to the basic wood flooring that you find at other flooring companies. Alliance Floor Source is a premier cork flooring supplier in the Toronto area. We are also a cork flooring installer for the Toronto area. Cork is a viable alternative to hardwood flooring. Cork Oak is found in a few Mediterranean countries and is actually harvested about once every 9 or 10 years with no harm done to the tree itself. The harvesting of the cork doesn’t require cutting down any trees and for this reason it is a wonderful renewable resource. Cork floors have been known to be very resilient and last for more than 50 years in even heavily tracked areas. Cork flooring in the Toronto area is gaining in popularity because of its resilience and durability. Cork flooring found in our Toronto store is extremely resilient to wear due to its internal cellular structure. Cork is almost 90% gaseous matter allowing it to recover very quickly from moving furniture or heavy traffic. When cork is pressured the gas in its tissue escapes, giving it a spectacularly comfortable feel as you walk upon it. Its “bounce-back” nature also reduces the indentations, much more so than carpet or wood floors. Cork flooring from our Toronto store is also insulates much more than basic hardwoods because of its air-filled nature and its shape. Again, due to its porous nature your cork flooring from our Toronto flooring store will also be much quieter as your children or grand-children run about your home. Cork flooring from our Toronto area store is very easy to maintain and is hypoallergenic to add. It will contribute to the air quality in your home because it will not absorb dust and dirt particles and it sweeps wonderfully smooth as well. Alliance Floor Source supplies and installs these cork flooring products from our Toronto supplier by following either a click system or floating floor installation process. For more details contact a representative and ask about cork flooring at our Toronto store. For all of your cork flooring installation needs in the Toronto area come and visit us to see our cork flooring samples in our Toronto store.